What can I say…. Triad Event Lighting loves draping! When combined with lighting, there is no better way to transform the landscape of a room and create a more intimate & softer affair. Overall, draping is super versatile. Yes, Super Versatile. For starters, how else can you change the size and shape of a room, reduce the amount of window light, hide unsightly objects (such as tired and worn out wall coverings) and all the while creating an intimate ambiance for all to enjoy. See what I mean? Now that you have a little more knowledge about all the wonderful world of event draping, let’s take it one step further, creating the perfect head table backdrop. Now, before reading further, I have to let you know that this isn’t a step-by step tutorial, (sorry to disappoint). I mean, that’s why you hire us. But seriously, we thought it would give you a little more insight and direction so the process doesn’t seem as daunting. First, there are many things to consider such as location of the backdrop itself, style, cultural significance, texture, color, and so on. Head Table backdrops are usually the focal point of the room, so in our opinion, they require a more full appearance. Basically, more fabric is needed than wall or room perimeter draping. 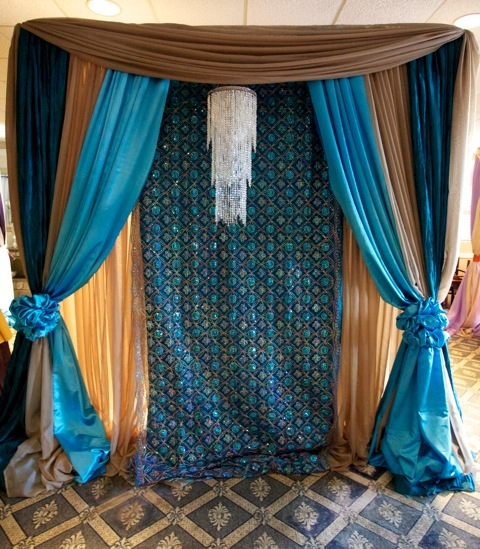 Adding a Valance (soft flow of fabric) attached to the backdrop is always a nice compliment. But you don’t have to stop at one. Add 2 or three with multiple swags, if you’d like. The more the merrier; we always say. This method of draping adds more depth to your backdrop and creates the ultimate WOW factor. Other ways to create depth is to add curtains and forgo the valance. (We’ll talk about this more in our next blog) This is a nice, clean look. Lastly, to top it all off, add some BLING. Options are only limited by the imagination. Tiebacks such as rhinestones bands, floral accents, brooches and buckles are always a big crowd pleaser. I saved the best for last. Finish your one of a kind backdrop off with uplighting. White is always a safe choice but there are other color options to accentuate your dream backdrop. It really depends all on the color combinations. In the end, that’s why you call us, Triad Event Lighting. We’re here to help you with these decisions and make your day as special as you’ve dreamed. Feel free to contact us. and we’ll gladly walk you through the process. Location: Stand in the Center of the room when thinking about your room draping. It will help you gain symmetry in your layout and design. 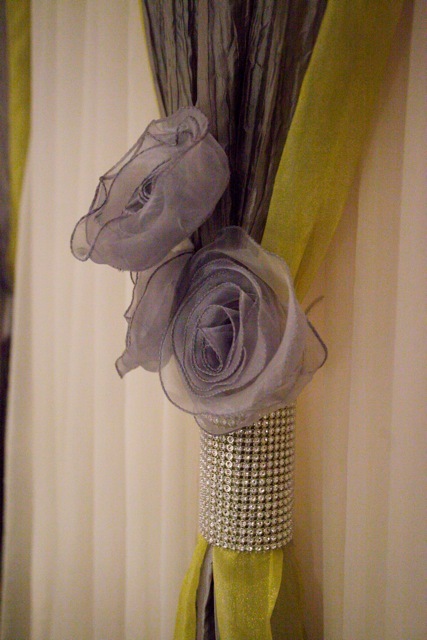 Style: Choose a draping style that will best compliment your décor. Texture: Draping comes in various textures, such as velour, taffeta, sheer voile, satin, and an assortment of specialty fabrics.